Our Point of Sale (POS) software provides support for multiple Cash Registers per store for multiple stores. Our Point of Sale (POS) software processes Credit Card and PayPal payments in real time. Our POS software is designed to easily scale up to big chain supermarket operations, yet it is priced to be affordable by single store retailers that are in the growth stage. Our system grows with your business. We provide tight integration between our POS software and our Backoffice Distribution software, so open account customers can come in person and execute purchases on account or pay pending balances at the stores. Our Web Store (Web POS) software provides support for multiple Web stores that share a single backoffice operational and accounting software. We provide the only Web Store (Web POS) eCommerce software suite completely integrated in real time with powerful ERP Back Office Suites for completely automated eCommerce operations. Our Web POS eCommerce software is designed to handle heavy transaction volumes for a big online retailer, yet it is priced to be affordable by single site online retailers that are in the process of establishing their Web retail presence. Our seamless integration features provide for the fluid flow of orders, invoices and payments from the eCommerce software into the fulfillment and accounting modules, as needed by a medium to big online retailer that operates a Web POS with a heavy transaction load. Our Web POS system processes Credit Card and PayPal payments in real time. 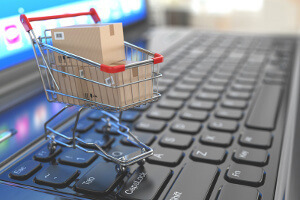 Our Web POS system obtains shipping rates in real time from UPS, FedEx and USPS, using standard or negotiated rates and flat rate boxes, and automatically discarding rates that have restrictions that are not met by the merchandise to ship, like hazardous materials restrictions and size/girth restrictions for international shipping. The eCommerce software provides the customers with their history of orders and real-time tracking of their shipments. Customers can convert order totals to their own international currency for easy comparisons of costs. Our online retail solutions provide seamless integration with our Smart Phone App for your customers, with both platforms seamlessly integrated to provide the ultimate online eCommerce software platform.